Mix sour cream and lime juice in a small bowl; cover and chill. Place onions in large heatproof jar. Heat vinegar, sugar, salt, and 1/3 cup water in small saucepan over medium-high heat, whisking occasionally, until sugar and salt are dissolved, about 3 minutes. Pour pickling liquid over onions (onions should be submerged). Let cool. Heat oil in a large skillet over medium heat. Cook chorizo, breaking up meat and stirring occasionally, until browned and fat is rendered, 6–8 minutes. Using a slotted spoon, transfer chorizo to paper towels to drain (do not pour off fat from skillet). Add carrot and parsnip to skillet and cook, stirring occasionally, until golden brown and tender, 8–10 minutes. Mix in chili powder and cayenne, season with black pepper, and cook, stirring, 30 seconds. Using a slotted spoon, transfer to a paper towels to drain; season with salt. Meanwhile, whisk eggs in a large bowl to blend; season with salt and pepper. Heat butter in a large nonstick skillet over medium heat. Cook eggs, stirring occasionally and scraping bottom of skillet with a heatproof spatula to form large curds, until just set, about 3 minutes. Remove from heat and mix in chorizo. Fill tortillas with egg mixture and sweet potatoes and top with lime crema, Tomatillo Salsa, Rice Vinegar–Pickled Red Onions, and cilantro. Mix soy sauce, 1/4 cup water, red wine vinegar, sugars, garlic and ginger in a small saucepan over medium heat. Stir with a whisk until sugar is dissolved. In a small bowl, whisk together 2 tablespoons warm water and cornstarch until cornstarch is completely dissolved. Heat sauce over medium high heat. Slowly whisk in cornstarch mixture and simmer until thickened. Remove from heat and set aside. Heat vegetable oil in a large skillet over medium-high heat. Add diced onions and sweet potato and cook until soft. Crumble ground turkey and garlic into the pan and cook until turkey is about half cooked. Add grated carrots and chopped broccoli and continue to cook until turkey is no longer pink. Pour teriyaki sauce over cooked turkey and vegetable mixture and stir. Simmer for about five minutes to combine the flavors. Spoon meat over rice or noodles. Garnish with green onions and sesame seed and serve immediately. Heat oil in a large heavy pot over medium heat until shimmering. Add diced onion and cook, stirring occasionally, until soft, about 3-5 min. Add garlic and red pepper flakes and cook, until fragrant, about 30 seconds, stirring regularly. Add collard greens to pot by the handful, making sure each batch wilts slightly before adding more. Add broth to pot and bring to a simmer. Cook, stirring often, until greens wilt and shrink to half their size, about 4 minutes. Lower heat to medium-low, cover pot partially, and simmer until collard greens are tender and there’s very little liquid left over, about 10 minutes. Stir occasionally. Add in vinegar and sugar and cook until sugar dissolves, about 1 minute. Season with salt and pepper or adjust vinegar, sugar, and red pepper flakes until you’re satisfied! Grease cast iron or any oven-safe dish with olive oil. Cover dish with foil and bake for about 35 minutes, or until fish is flaky and potatoes are soft. Serve immediately with fresh lemon wedges and red pepper flakes. Peel and cut rutabaga, potatoes, carrots, and apple into one-inch cubes. Set aside in a large bowl. Thinly slice celery and dice onion and set aside in a small bowl. Combine flour, salt, pepper, and thyme in a large bowl. Toss cubed stew beef in the flour mixture, making sure all surface areas are evenly coated. Heat olive oil on medium-high heat in dutch oven or heavy-bottomed pot. Working in batches, brown beef evenly on all sides. Add onion and celery and cook for two more minutes. Bring to a boil and reduce to medium-low. Simmer for 30-45 minutes. Add remaining veggies and apple. Bring to a boil and reduce to low. Cook for an additional 30-45 minutes, or until vegetables are tender. *You may need to add water to the pot so that everything is covered by one inch of liquid. For this recipe, you’ll be making both the rice and the toppings and assembling at the end. We broke the recipe down into segments to make it easier to follow. Enjoy! Rinse rise thoroughly in strainer under cold water until water runs clear (about 3 minutes). Add rice and 2.5 cups water to uncovered pot. Bring rice and water to a boil. Once boiling, reduce heat to lowest setting and cover tightly. Simmer for 15 minutes. Do not check rice until 15 minutes have passed. Rice should be tender but not mushy. Remove rice from heat and spread thinly along sides of a large (non-metallic) bowl with a wooden spoon. Let cool completely. In a small bowl, combine rice vinegar, maple syrup and 1 tablespoon of salt and mix to combine. Pour vinegar mixture over rice and mix gently to combine. Add vinegar, maple syrup, and 2 tablespoons salt to a large saucepan and bring to boil. Add cucumber and return to boil. Lower heat and simmer for 2 minutes. Transfer cucumber and brine to a heat-safe container and refrigerate until ready to use. Heat 1 tablespoon of sesame oil in large pan over medium heat. Cook until carrots are just tender. Set aside. Cut white ends off Bok Choy and separate leaves. Heat 2 tablespoons sesame oil over medium heat. Add garlic and stir until fragrant, about one minute. Add Bok Choy and soy sauce to pan and stir until bok choy has wilted. Set aside. Add 1 teaspoon of sesame oil in a pan over medium heat. Add mushrooms and let cook for a minute. Add 2 tablespoons soy sauce and 1 teaspoon of maple syrup and stir to cover mushrooms. Continue heating until mushrooms are tender and fully glazed. Set aside. Once you have prepared all of the individual toppings you’d like, add all to bowl over mounded sushi rice. Feel free to drizzle soy sauce, teriyaki, or sriracha to add an extra zest!" In a medium size cast iron, melt butter over medium heat. Once butter has melted and cast iron pan is hot, add steak to the pan. Cook for 2 to 3 minutes, depending on your preference. Flip the steak and add the rosemary to the pan. Cook for 2 minutes more, or until the steak is cooked to your liking. Take cast iron off the heat and place aside to rest. In a medium saucepan, heat canola oil over medium heat. Add onion and garlic, cook, stirring often, until softened, about 8 minutes. Add mushrooms and cook, stirring often, until they begin to release their juices, about 10 minutes. Add vegetable broth, soy sauce, thyme and sage; simmer for about 15 minutes. Mix cornstarch and water in a small bowl. Stir into the sauce and simmer, stirring often, until slightly thickened, about 10 minutes more. Pour sauce on top of the steak and enjoy! Extra tip: Enjoy this Steak and Mushroom sauce on top of mashed potatoes for a delicious meal! Peel and cut the potatoes into even sized pieces. Put them into a large pot, cover them with cold water, and add a large pinch of salt. Bring to a boil and simmer until the potatoes are fork tender, about 20 to 30 minutes. Meanwhile, in a small pot gently heat the cream and butter over low heat. When the vegetables are done drain them well. Put the potatoes back into the pot over medium heat. Gently stir them to remove any excess moisture; be careful not to burn them. While the potatoes are still warm, mash them with a potato masher. Add the warm cream a little at a time and beat with a wooden spoon until the potatoes are fluffy. Season with salt and pepper and gently stir in the chives. Serve immediately. Extra tip: Looking for a way to use up parsnips? Add up to 2 pounds of parsnips to this recipe and prepare the same way as listed above! Combine the flour, sugar, baking soda, salt, cinnamon, nutmeg, eggs, oil and vanilla in a large mixing bowl. Mix well with wooden spoon. Scoop into 12 regular-sized greased muffin tins and sprinkle a little coarse sugar on top of each muffin. Bake for 18-25 minutes or until toothpick comes out clean. Enjoy! Extra tip: For a delicious winter treat, melt butter and honey on top of warm muffins straight out of the oven! Preheat oven to 400F and move the rack to the middle position. Prep your carrots and squash. Add the carrots and squash to a baking sheet and toss with 3 tablespoons olive oil, the balsamic vinegar, garlic powder, Italian seasoning, and salt & pepper. Roast for 35-45 minutes, or until the carrots and squash are nice and soft and lightly browned. Stir once around 20 minutes into cooking. When the veggies are about done roasting, heat the remaining tablespoon of olive oil over medium-high heat in a soup pot. Sauté until the onion is lightly browned (5-7 minutes). Add the carrots and squash, vegetable broth, and ground cumin to the pot. Increase heat to high and once it starts to gently boil, reduce heat to medium-low and simmer for 5-10 minutes. Mash ingredients together (or puree with a blender if you’d prefer). Garnish with yogurt, cheese or any topping you’d like! Grate a total of three cups root veggies and onion into a dishcloth-lined mixing bowl. Lift the grated veggies out of the bowl using dish cloth and ring out most of the excess moisture over the sink and return veggies to mixing bowl. Crack two eggs into bowl and mix until incorporated. Add remaining dry ingredients and lemon juice and combine. Take a small portion of mixture in the palm of your hand, and if mixture is too wet to stay together, add another sprinkle of flour. Heat about a quarter inch of oil on medium-high heat in a large skillet. Test if oil is ready by placing a small amount of mixture in pan, and if bubbles form around edges, oil is ready. Heat a large pan to medium-high. Add oil. Add potatoes, onion and celery and season with salt and pepper. Cover and cook for 15-20 minutes, stirring occasionally. Once potatoes are almost tender, turn up heat to high and add garlic. Cook for 2-5 minutes, stirring as you go. Once potatoes are browned, remove from heat and serve with sliced green onion. 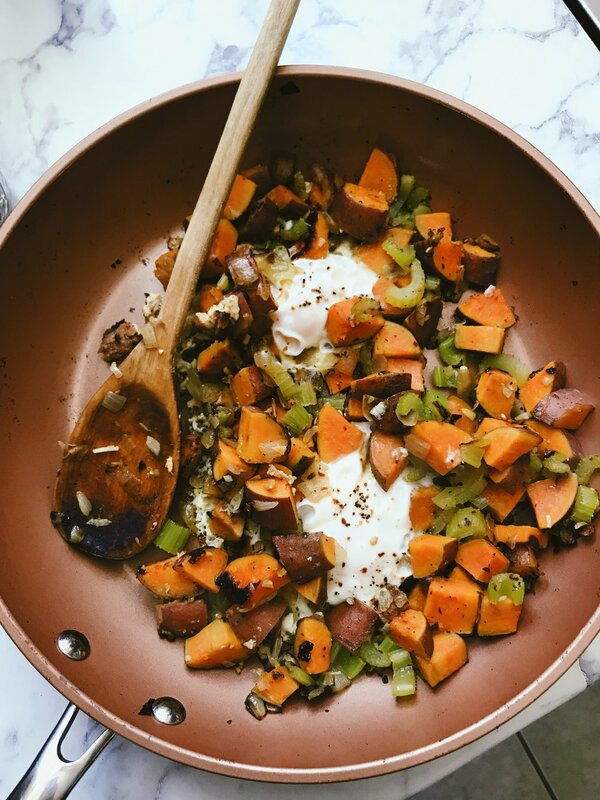 Consider adding cheddar or any other cheese to this hash! 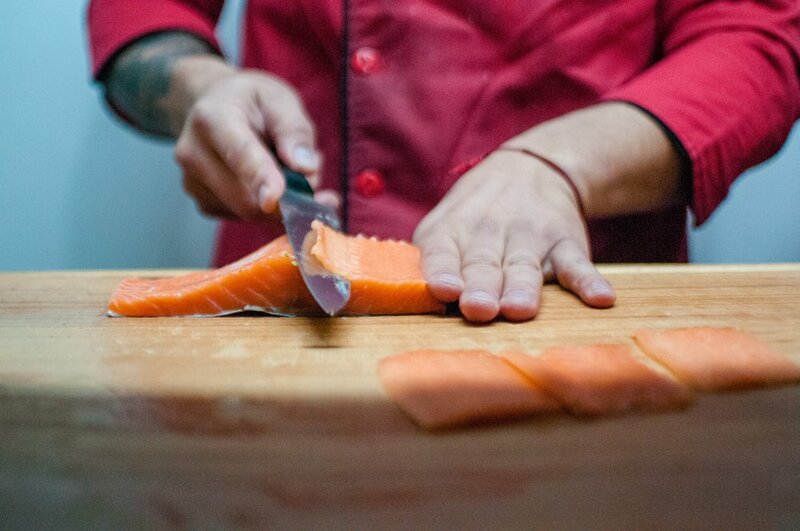 Cut salmon into one-inch cubes. Combine teriyaki sauce, sesame oil, garlic, and ginger in a large bowl or glass baking dish, and let salmon marinate (covered) for up to 30 minutes in refrigerator. In a large wok or skillet, saute mushrooms and onions on medium-high heat for 5-8 minutes, or until onions are translucent and mushrooms are tender and brown. Add salmon and its marinade and saute until salmon is light pink and opaque (~4 minutes). Serve on its own or over rice. Top with shoots, sliced green onion and sesame seeds if desired. Drizzle oil and salt and pepper over carrots and roast for 25 minutes, or until a fork slides easily into the carrots. In a large skillet, cook beef and onion until meat is fully cooked through; drain liquid. Add in corn, tomato sauce, and spices. Place in a baking dish. Once Butternut squash is tender, remove from oven and cube into small pieces. Mix together with the meat mixture. Cut sweet potato in half and remove the pulp, place in a medium bowl. Mash together with butter, milk, and salt and pepper. Spread sweet potato mixture evenly on top of the meat mixture. Bake in oven at 350 degrees for 30 minutes. This shepherds pie includes the ground beef, sweet potato, onion, butternut squash and microgreens for a garnish from this weeks basket. This dish proves to be a simple, delicious meal for a cold winter's evening! 4 Tablespoons caramel, plus more for drizzling on top! Top with caramel apples and enjoy! We chose to use gluten free bread with the french toast but would also work great with the rustic rolls included in this week’s package! *For future use: Just pop individual herb & oil cube into a sauté pan or pot, heat and use just as you would regular olive oil for stove top cooking!